Follow the Fifty is truly blessed to be working with this amazing creative team. In the span of just a few short weeks they have created a brand and website that captures the beauty that we see in our models. In preparation for the highly anticipated Follow the Fifty: Models of Heart Health Campaign (FTF) kick-off event this Saturday, March 31st, the Northeast District Department of Health (NDDH) and HealthQuest Northeast Connecticut, a regional health and wellness collaborative working to improve the health of Northeastern Connecticut residents, have launched a new campaign website. The website will serve as the social media hub throughout the year-long campaign to promote event activities and document the transformative journey of the models. 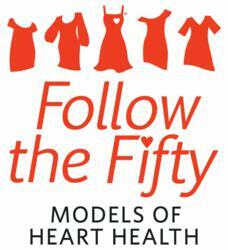 Follow the Fifty: Models of Heart Health is an energetic and empowering women’s heart health initiative that was funded through The Heart Truth® Community Action Program, a women’s heart health awareness and action campaign that warns women about heart disease and provides tools to help them take action against its risk factors. Originally designed to recruit fifty women from Northeastern Connecticut to serve as models of heart health, the initiative was expanded due to the overwhelming response to the model recruitment campaign. On February 29, 2012, 183 women were selected as models to lead others in Connecticut's "Quiet Corner" on a remarkable journey of heart health. The Follow the Fifty logo, website and social media pages have been developed by the creative team from MAD Communications based in East Hampton, Conn. and Angell House Design based in Central Village, Conn. The new website developed on a WordPress platform is designed to be a work in progress to allow the site to be continually expanded as the campaign progresses. The home page features large banner images and easy-to-navigate links to connect with all of the FTF social media sites including Facebook and Twitter. As video content is created, it will be shared through YouTube and Vimeo. A blog component will also be added to allow the models, coaches and cheerleaders the opportunity to share their stories on the FTF website. The kick-off event this Saturday at Killingly High School will include a Social Media Station that will feature a presentation of the website and all of the ways the models can use the tools of social media to help spread the word about The Heart Truth® and Follow the Fifty. For more information about Follow the Fifty, contact NDDH at 860-774-7350 or email contactus(at)followthefifty(dot)org. Follow the Fifty is sponsored by a grant from the Foundation for the National Institutes of Health as part of a public-private partnership with the National Heart, Lung, and Blood Institute to promote The Heart Truth®, a women’s heart health awareness and action campaign. Funding is provided by individuals and corporations including The Heart Truth partners Belk Department Stores, Diet Coke, and Swarovski. HealthQuest Northeast CT is a collaborative health partnership coordinated by the Northeast District Department of Health and has been designated as a national Action Community for Health, Innovation and Environmental Change (ACHIEVE) by the Centers for Disease Control and Prevention. Partners include: The Northeast District Department of Health, Day Kimball Healthcare, Generations Family Health Center, Northeastern Connecticut Chamber of Commerce, Plainfield Public Schools, Plainfield Recreation Department, Quinebaug Valley Community College, Representative Mae Flexer, Senator Donald Williams, Steven Townsend, Thompson Ecumenical Empowerment Group, Town of Putnam Community Development and WINY Radio. The coalition works to improve the health of residents through policy and environmental change, with a focus on reducing chronic illness by increasing physical activity and improving access to better nutrition in northeastern Connecticut schools, worksites, communities and homes. Although significant progress has been made in increasing awareness among women that heart disease is their number one killer (from 34 percent in 2000 to 69 percent in 2009), most fail to make the connection between its risk factors and their personal risk of developing heart disease. The Heart Truth® created and introduced the Red Dress as the national symbol for women and heart disease awareness in 2002 to deliver an urgent wake-up call to American women. The Red Dress® reminds women of the need to protect their heart health, and inspires them to take action. For more information about women and heart disease, including materials such as The Healthy Heart Handbook for Women and fact sheets about women and heart disease, please visit http://www.hearttruth.gov or call the National Heart Lung and Blood Institute (NHLBI) Health Information Center at 301-592-8573.